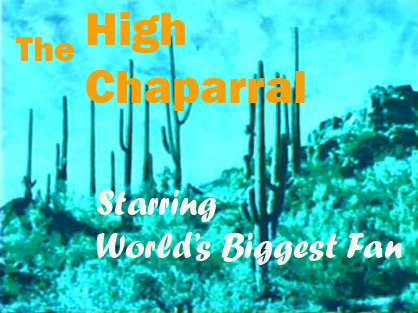 Be a High Chaparral Star by helping bring all our favorite HC stars, crew and production folks to Tucson. We're looking for special fans who can help pay the expenses of the very special people who created our favorite show. By becoming a Reunion Sponsor and contributing $60, you'll help pay for flight, room, food, and other expenses - and bring Manolito Montoya, Sam and Joe Butler, and all the rest of the Chaparral family home to Tucson. A hand-signed thank-you note from The High Chaparral stars. A keepsake copy of the 2009 HC Reunion invitation, with original artwork by Patricia Schantz. Have your name included on a recognition list that will be given to each guest of the reunion. A special identification Sponsorship name-tag, to keep and wear at the reunion. At the $100 and up level, attend the Sponsorship Dinner on Friday evening at the reunion. A HUGE thank you to the fans who've already become sponsors by signing up for the Friday night sponsor's dinner - see the list on the newsletter Sponsor's Page. To become a sponsor, email info@highchaparralnewsletter.com. Reunion invitations are in the mail to a long list of High Chaparral stars, celebrities, guest stars, producers, crew members, stuntment, wrangers, and many other creative and talented people who made The High Chaparral our favorite show. The reunion is a unique event, because HC fans play host to a large number of guests, paying honor to all who created this innovative and ground breaking show. As supporters, hosts and sponsors, here's your invitation to the HC folks. 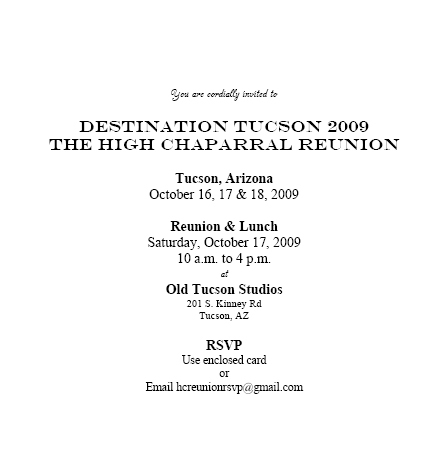 It's an invitation to you as well, to join everyone in Tucson for a true reunion at the original High Chaparral ranch. 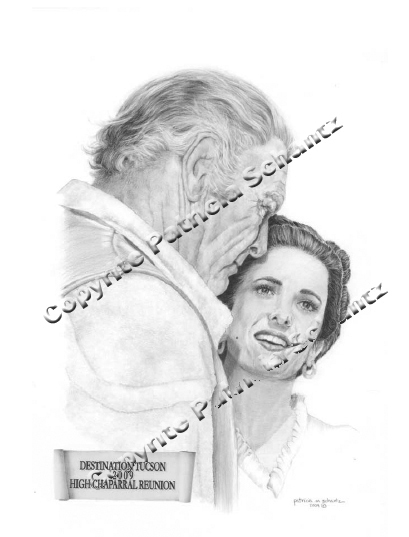 The beautiful cover features an original piece of art created specially for the reunion by artist/fan Patty Schantz. Remember there is a Reunion Reservation Deadline. Make your reservation now! Not only do you help us budget, but you save money, because costs increase as time passes. The High Chaparral Reunion 2009 Invitation that's been sent to the guest list. You're invited too - the fans are the hosts, sponsors, and along with the stars, honored attendees. This is your chance to meet Henry Darrow, Bob Hoy, Don Collier, Kent and Susan McCray, plus many others. And you'll meet many other High Chaparral fans who share your love of the show - meeting other fans and making new friends is one of the best parts of these events! $225 for the 3 day package, costs increase on July 1 to $300, so don't delay. Other costs increase as well, so book today. 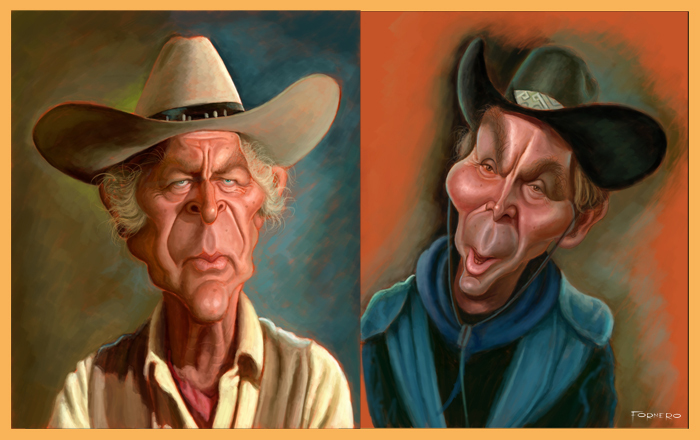 The story of The High Chaparral has inspired a series of caricatures by artist Walter Fornero. 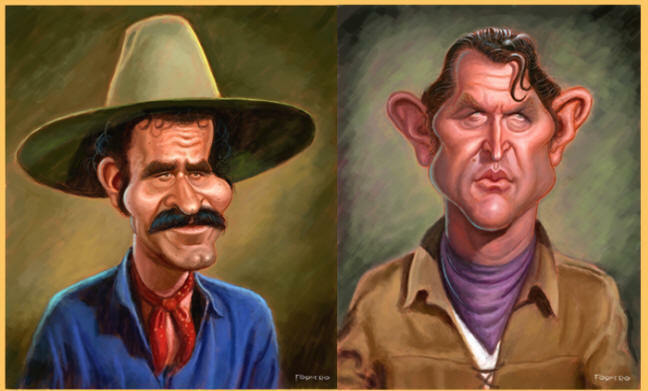 An avid fan from Argentina, he created this tribute to the Cannons, Montoyas, and Bunkhouse Boys, as he explains, "I’ve been devoted to cartoons for a long time and in this case I’m inspired by the great love and admiration I feel for The High Chaparral’s characters. Doing these cartoons was a way to give back all that enjoyment I’ve had watching this great series here in Argentina. And still get, of course!" Fornero’s HC artwork currently includes Big John, Buck, Blue, Manolito, Victoria, Sam and Joe Butler, Pedro and Vaquero. It’s been featured on www.thehighchaparral.com, generating many comments and email from fans. Hearing from people around the world has been a pleasant surprise for him. "I’m happy to share with people, and display the pictures I do. It’s the objective of an artist, I’m fulfilled when someone sees and recognizes my work," he said. You can email him your comments as well. 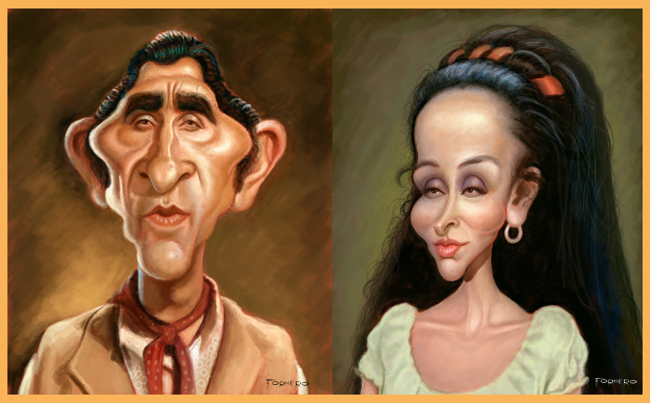 Check out Walter’s website for more examples of his art, or to purchase your own copy of The High Chaparral cast caricatures. Plan to attend The High Chaparral Reunion and with luck you might be able to ask Walter to sign your copy, because he hopes to come to the reunion, too. "One of my dreams is to be able to attend the next reunion of The High Chaparral in Tucson." Which HC Character are you?? Fan reunions and conventions are a great way to get together with others. People dress up as their favorite characters and everyone accepts it in the spirit of fun. Fans of many classic shows hold conventions and The High Chaparral is no exception. Unfortunately, not everyone is in a position to attend these events. Did you miss past High Chaparral reunions? Not sure you’ll make the 2009 Reunion? Or is your registration set and are you ready to pack your bags for Tucson in October? No problem. We’ve decided to do something for all the fans across the world. All you need to participate is a photograph! If you answer YES to any of the questions below, we want to hear from you. Do you have a favorite HC character? Have you ever made a costume of this character? Do you resemble a HC character? If you were lucky enough to attend any of The High Chaparral reunions, we want to hear from you too! We’re going to have our own photo gathering here at the newsletter. Get your character costumes on, grab the camera and send us a photograph of yourself. If you’re a fan without a costume, why not try making one? You could even be 'Miscellaneous Bunkhouse Boy' - all it takes is a hat or bandanna! Send us your picture when it’s ready. We’ll give you regular notices when the photo gallery is updated. Here's a few samples to give you ideas. Send your fan photo to info@highchaparralnewsletter.com. Look forward to hearing from you! The Mark Slade Studio has added a new chapter to The Fables Project, conceived and written by Melinda Riccilli Slade with illustrations & photography by Mark Slade. The studio's RedactedRedux section recently announced Morgan Riccilli Slade's new album THE WESTERN ADDITION, which can be downloaded at www.blastmymusic.com (search for the western addition). Sample the music on Myspace. Veteran character actor Malachi Throne is familiar to HC fans for his roles in the episodes Bad Day for a Bad Man, and The New Lion of Sonora, as well as a hundred other appearances in series TV – Star Trek, Mission Impossible, It Takes A Thief, Babylon Five, Law & Order, Melrose Place, Edge of Night, and a hundred others. The Accomplices is the highly acclaimed true story of Peter Bergson, who shook up both the U.S. State Department and the American Jewish establishment in his fight to rescue European Jews from the Nazis. Throne has the role of Rabbi Stephen Wise. As Throne says, “It is the story of one man’s attempt to help European Jews escape the Final Solution which lead to the Holocaust. He’s prevented from doing just that by the government of the United States, the State Department and the President, by not allowing any refugees into the U.S. and by creating the most difficult regulations such as telling the public they’ll lose their jobs to cheaper labor." It’s a story that is relevant and timely. "It sounds very familiar, even in this present administration. Jobs, jobs, jobs, the political cry is always the same,” he said. Plenty, if it happens to be a TV series, in the opinion of David Dortort, creator of Bonanza and The High Chaparral. Dortort feels the title of a series has much to do with its public acceptance. "I wanted a colorful name for The High Chaparral a name which came from the Southwest itself just as Ponderosa depicts the mountain country of Bonanza," said Dortort. Chaparral describes a low, dense, impenetrable vegetation or bush with a prickly growth. Dortort first thought of calling the series Saguaro (pronounced Sa-war-o after the tall columnar cactus so plentiful in Arizona.) Saguaro, an Indian word picked up by early Spanish settlers in the Southwest, had only one drawback. It was impossible to pronounce. Chaparral is also closely related to the Spanish word chaparreras, or more familiarly the chaps worn by cowboys to protect the legs from the chaparral, snake and animal bites and the cold. Chaparral also refers to the speedy roadrunner in the cuckoo bird family. 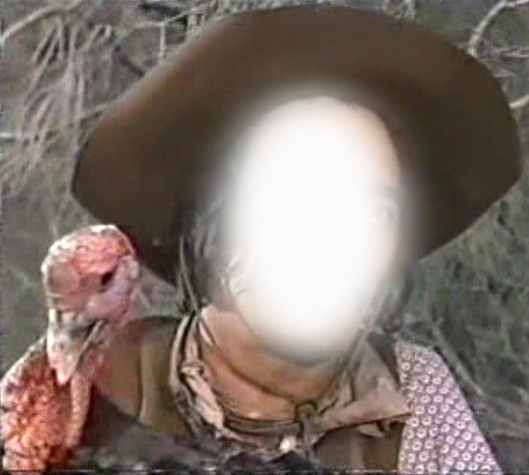 In the first episode of the series the ranch was named when John Cannon's (Leif Erickson) first wife Annalee (Joan Caulfield) asked: "What is that bush called, the green one?" "I christen thee The High Chaparral, the greatest cattle ranch in the whole territory, the whole world," Annalee responded. 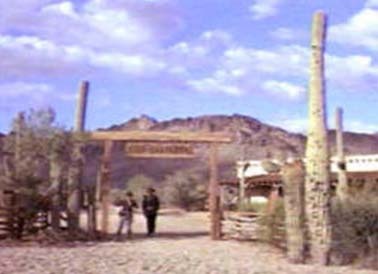 Annalee Cannon names the ranch 'High Chaparral' in this scene from Destination Tucson. Can't see the video? Open the newsletter in a web browser. Mark Slade as Blue Cannon and Cameron Mitchell as Buck Cannon are dwarfed by a giant Saguaro in front of The High Chaparral ranch house. The West wouldn’t be ‘The West’ without them. There are nearly 2,000 species of cactus the world over and all are believed to have originated in the Americas. Very few people haven’t seen a cactus at least once in their lives. OK, we’ll give the more isolated Eskimos and Rainforest people a break since neither of those environments is cactus territory. Other than that, pretty much everyone has seen one. The cactus species you most probably associate with the west are the saguaro and the barrel. Some fans won’t need to be told that the Cannon ranch was originally going to be named Saguaro after this plant. The fact that many people at the studio where High Chaparral was filmed weren’t even sure how to pronounce the word was one reason it was abandoned – and with it, the humble cactus’ shot at stardom. Well, maybe not stardom since, as I understand it, none have ever successfully learned to act but at least some degree of recognition. And so, they continue their lifelong roles as silent, but prickly, sentries dotting the magnificent desert landscapes of our favourite westerns. The saguaro cactus is also called The Giant Cactus and for good reason. Every outdoor scene on HC has them. It is an ‘arborescent’ cactus. Arborescent means resembling a tree or treelike. A champion specimen in Arizona reached a height of nearly 14 metres (45 feet) with a girth of over 3 m (10 ft) so it’s easy to see how it gets both its giant and treelike names. Wouldn’t that one have looked wonderful outside the Cannon ranch! Saguaro is a long lived species, some of which have exceeded 150 years old. I developed a whole new respect for them when I learned that a side arm can take up to 75 years to grow. They will grow a bit faster with more rain but even in ideal conditions they’re still very slow to gain those arms. It’s not impossible that there exist today among those we see, true pensioners that were only tiny during the late 1800’s (though we’re probably pushing it but it’s not impossible). The major pollinator for the saguaro is the bat so you won’t be surprised to learn that its flowers open at night, when bats are most active. 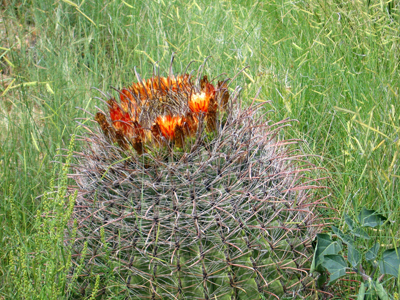 Another cactus that features in High Chaparral is the barrel cactus. It’s a much smaller cactus, averaging about a metre high (3 ft). It’s recognizable by its barrel shape and pronounced accordion-like ‘ribs’. It has a lifespan of 50-100 years. The Seri Indians (from the Mexican state of Sonori) recognize three species of barrel cactus; saguaro barrel, big barrel and true barrel. The true barrel is also commonly called ‘The Killer Barrel’ as a warning against ingesting any part of it. It is sometimes called the Compass Cactus because it points toward the south to reduce the effects of sunburn. Have you seen the Survival episode of High Chaparral? If so, you will recall that John and Blue ate the pulp from a barrel cactus and later Blue complained of ‘sour stomach’ as a result, but thought their Apache captive could survive on it for days without suffering ill effects. For me, this mystery needed some investigation! How could one man be fine while another suffered? My first question was, is there something poisonous about the barrel cactus or was it just a coincidence that Blue felt sick? The Seri name of Killer Barrel was a giveaway. Sure enough, red is often a warning colour in nature and this red flowering cactus is no exception. Indeed, people are warned against eating any red flowered cactus (and you would need to check with experts before tasting the others). The pulp of the barrel cactus contains crystals of oxalic acid. Consequently, the liquid also contains it. Oxalic acid is an alkaline substance used as a bleach. Not surprisingly, it’s poisonous if taken in excess. While many fruits and vegetables contain trace amounts of oxalic acid, the barrel cactus contains more than is good for anyone. It appears that taken in very small amounts and with food in the stomach, the effects of the toxin can be reduced. This leaves us with the possibility that the Apaches, wise in the ways of the desert, knew that one must have something in their stomach and take only the smallest possible amount to quench the thirst. Meanwhile, John and Blue weren’t aware of this. Blue might have ingested too much and on an empty stomach. That would certainly explain what we see in the episode. Nonetheless, most learned people will agree that it’s a bad idea to ingest any barrel pulp or liquid at all. This is something the Seri, and no doubt other Indians have known for a long time. Symptoms of eating this species of cactus include nausea, diarrhoea, body aches, difficulty or complete inability to move or walk, nosebleeds and red, burning eyes among other things. With this in mind, I’d say John and Blue got off easy! Thank you so much for this wonderful newsletter. Do you have more information about which actors are coming to the reunion? Thank YOU, and thanks to all our readers and contributors! 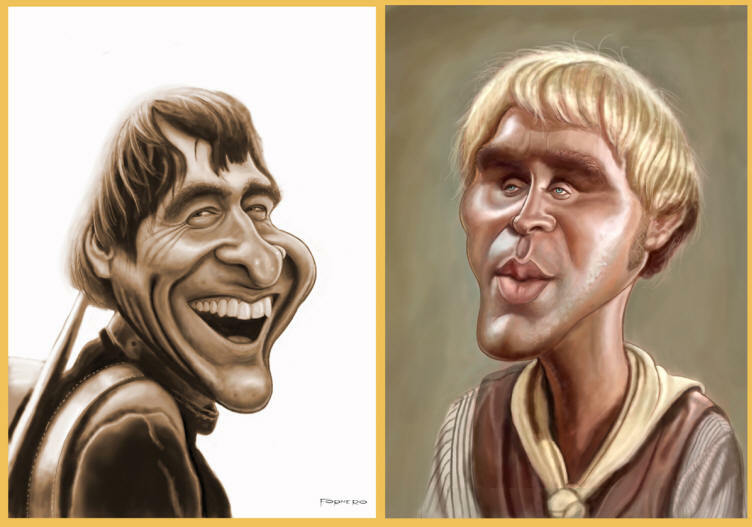 Excitement about the 2009 Reunion is building - not only with fans but among the High Chaparral cast and crew. Please remember they all still work at their profession, so plans are subject to last minute change - work, family issues, or health might force an emergency cancellation. Right now we have verbal agreement from Henry Darrow (Manolito Montoya), Don Collier (Sam Butler), Bob Hoy (Joe Butler), Ted Markland (Reno), and Rudy Ramos (Wind). Kent and Susan McCray (producer and casting) were essential to the show and will attend. The McCrays are #1 fan supporters, have wonderful stories, and High Chaparral was Kent's baby- no one has more knowledge about every aspect of all things Chaparral. Other great folks who've said they want to come are Jack Lilly (double for Leif Erickson and wrangler - a must-meet for all fans), Bob Shelton (founder of Old Tucson), and Neil Summers (stuntman). The invitations are in the mail and RSVP's will soon start to arrive - so watch the newsletter for more information about who's planning to attend. I am a Mexican fan of High Chaparral and I want to know the name of the Irish song that Stinky Flanagan sang in this episode, and how can I get it? This is a popular question, because the song is so beautiful and haunting. 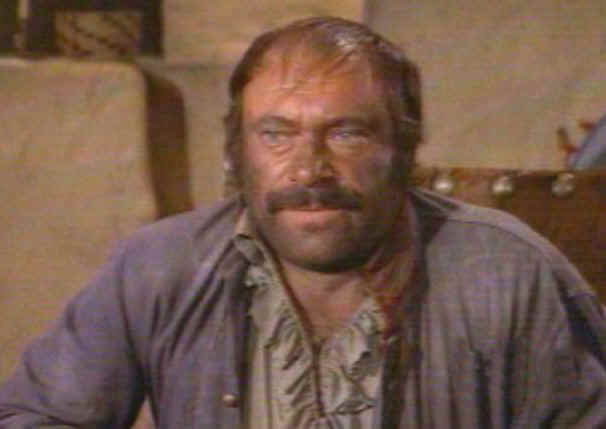 Sweet Maureen O’Hare was composed by Harry Sukman, with words by William Leicester, a writer, actor, and executive story consultant on several High Chaparral episodes. Like so much of the music in the series, it sounds authentic to the time and place. Fans often insist it must be a long-lost Irish folk ballad. Susan McCray endowed all of Harry Sukman’s sheet music to Eastern Connecticut University’s J. Eugene Smith Library, so it is not available commercially. Ever wonder about a nature-related question in Arizona? What happened backstage or in casting? Send us YOUR questions! If we don't know the answer we'll ask the right Chaparral contact and find out for you! Email info@highchaparralnewsletter.com with your puzzler. Thank you to The McCain Ranch/The NorthFork Weekly for promoting The High Chaparral Reunion with a listing. You can visit this site which has news about the TV show The Rifleman and see the Reunion listing. Margie, the author of the site, has photos of herself with Don Collier and Bob Hoy at the Festival of the West.